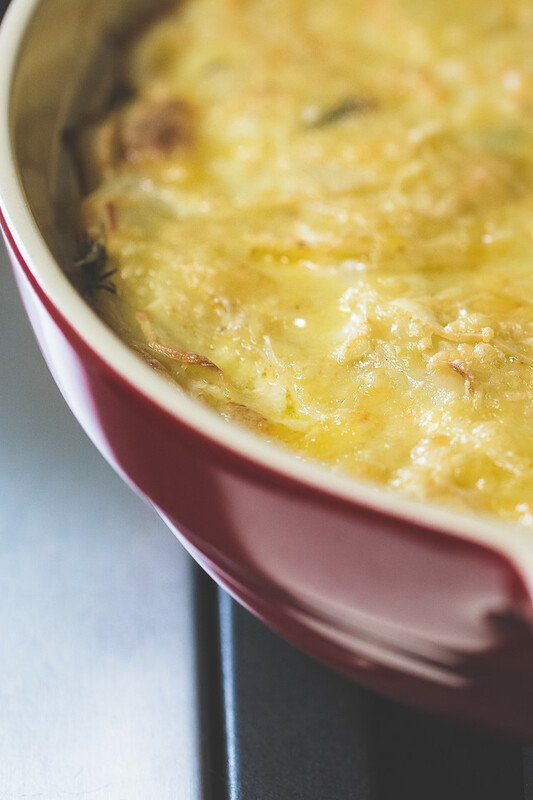 Scalloped Potatoes with Gruyere – this potato gratin is so rich and cream. 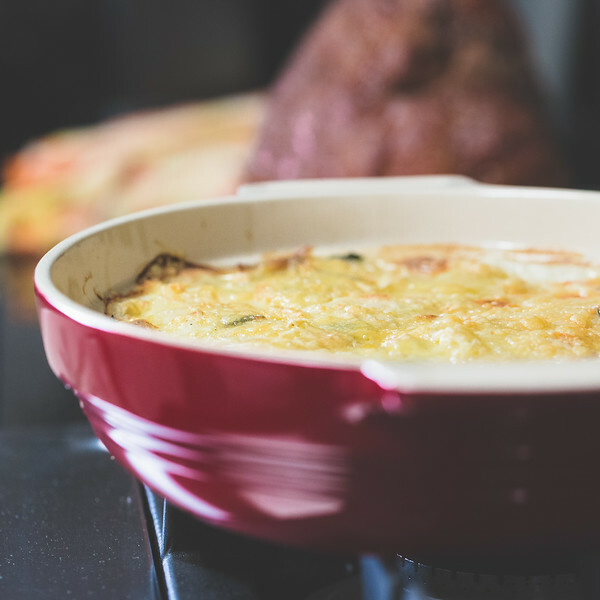 Everyone loves cheesy scalloped potatoes and when you make them with gruyere cheese, they are even better! Perfect for holiday dinners and easy enough for every day suppers! 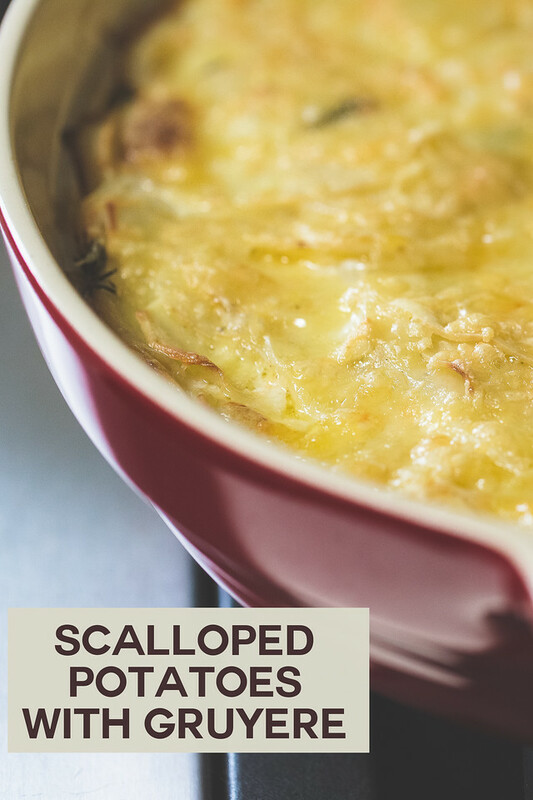 Click here to pin these Scalloped Potatoes with Gruyere now! What do you call a casserole filled with tender slices of potatoes, rich and cheesy and baked with cream? Do you call it cheesy scalloped potatoes or a cheesy potato gratin. It’s a little confusing when you go searching for answers. Most agree that the potatoes in scalloped potatoes are cut a little thicker than a gratin. Then I read that Au Gratin Potatoes have gruyere cheese in them and they are baked with cream. So, these Scalloped Potatoes with Gruyere are a very cheesy and yummy blend of the best of both! One of the things you’re going to love about these potatoes is how easy they are. You start by greasing a casserole dish. Then a mandoline makes quick work of thinly slicing the Yukon gold potatoes. You start cooking the potatoes, butter, half and half, thyme, salt, pepper and nutmeg until it starts to thicken. You then pour your slightly thickened potatoes into the casserole dish and bake. After baking you top with the grated gruyere cheese and bake again. Let sit before serving. These potatoes were so good. Nice and cheesy. The fresh thyme permeated the thickened sauce and gave it just a hint of a different flavor. Everyone will ask what’s in the sauce. Oh, and you might as well print off a couple of copies, because everyone will also ask for the recipe! We also love these cheesy Smoked Gouda Scalloped Potatoes! We alternate them with these scalloped potatoes with gruyere for our Thanksgiving side dishes, Christmas side dishes, and Easter side dishes! These Scalloped Potatoes with Gruyere are rich and creamy and so delicious! Preheat the oven to 350. Rub the garlic on the inside of an 8x8x2 casserole dish. Mince the rest of the garlic and use some of the butter to grease the inside of the casserole dish. Put the potatoes in a large saucepan with the garlic, butter, half and half, thyme, salt, pepper and nutmeg. Bring to a boil over medium high heat and cook stirring until the mixture has thickened slightly, about 2 minutes. Spoon the mixture into the greased casserole dish and bake uncovered for 50 minutes or until the potatoes are tender. Top with the cheese and bake for an additional 15 minutes. Remove from the oven and let rest for 10 minutes before serving. Update Notes: This was originally published in 2013 and has been updated for 2018. Thanks! You would love it! I’m scared of a mandolin but I can use the food processor! These looks decadently yummy, a perfect side for the cold weather and holiday meals. Yes, a food processor would work great too! 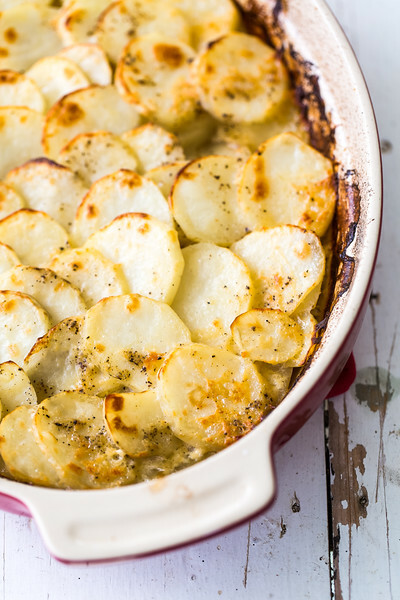 I love scalloped potatoes, but haven’t had them with greyere (which I also love!). This recipe is a definitely must-make as it sounds amazing!! Yes, you definitely need to try them with gruyere! Ohh what a perfect comfort food for these cold days! My family would love this recipe! We have it every Thanksgiving, and Christmas and Easter! If I don’t make them, everyone complains!